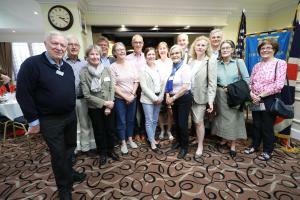 In the mid-1970s a group of Rotarians from Leeds clubs attending a Rotary International meeting in Harrogate got talking to some visiting Rotarians from Braunschweig, Germany. After a number of exchange visits in Leeds and Braunschweig over the next few years, the Rotary Club of Leeds and the Rotary Club of Braunschweig-Richmond entered into an official twinning partnership in 1984. The presidents at that time were Rotarians Bryan Herbert and Kurt Höweler respectively. The Braunschweig area has historical ties with the English crown, and the German club is named after Schloss Richmond, a small palace built in 1768 by Duke Karl Wilhelm Ferdinand of Braunschweig for his wife, Augusta, sister of King George III of England. To this day, the clubs visit each other every two years, alternating between Leeds and Braunschweig. With every visit we learn a little more about each other’s way of life and members of both clubs have formed lasting international friendships over the years. Our next visit to Braunschweig will be from 5th to 8th June 2019.